The Casio XJ-A147 is Casio's latest iteration of its light-weight, high-end, 1024x768 projector. It's rated at 2500 lumens, measured close to that in my tests, and is built around Casio's hybrid LED-laser light source paired with a DLP chip. What makes it the high-end model for its resolution in Casio's Slim Series is that it can read files from USB memory keys as well as show images from mobile devices by Wi-Fi, so you don't need to carry a computer with you. The hybrid light source is central to all of Casio's projectors, boasting ecological benefits, including being mercury-free, and helping keep running costs down. Its meant to last the life of the projector, with a rated 20,000-hour lifetime, eliminating the need for replacement lamps. It's also designed to save on electricity. With two non-Eco modes and five levels of Eco mode, you can choose just as much brightness, and use just as much power, as you need. Even better, Casio says that the XJ-A147's fifth-generation version of its light source uses less electricity for any given brightness than earlier versions, lowering running costs even more. Widely priced at $1109.99, with education pricing available, the XJ-A147 is expensive compared with models using traditional lamps. 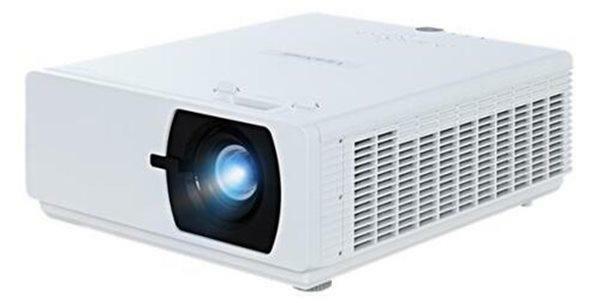 But if you add the cost of replacement lamps for competing projectors plus the additional electricity costs, the total cost of ownership is a lot closer, and could even be in the XJ-A147's favor. The savings in running cost helps make the XJ-A147 a more than reasonable choice. As expected for a data projector, the XJ-A147 does better with data images than video, the key issue being rainbow (red-green-blue flashes), which are always a potential problem for DLP projectors. With static images, like business graphics, I saw the artifacts only in images that tend to bring them out, and infrequently enough that it's unlikely anyone will be bothered by them. With video, they showed less often than with some projectors, but often enough that anyone who sees them easily is likely to find them annoying in at least some scenes. Good data image quality. Colors in data images were nicely saturated in my tests in all combinations of predefined modes and brightness settings. However some colors varied noticeably with different settings. Blue and red were a little dark with the brightest mode, for example, and yellow was vibrant with some settings but mustard colored with others. Very much on the plus side, the projector did a great job with color balance. The brightest shades in the brightest setting showed a tint, but that's true for most projectors. In all other settings, grays were suitably neutral for all shades from black to white. The XJ-A147 also did an excellent job with detail, which is more important for most data images. White text on black, for example, was crisp and readable at sizes as small as 9 points, and black text on white was easily readable at 7 points. The image was also all but rock solid even with an analog connection when showing patterned fills, which can bring out annoying pixel jitter and dynamic moire on some projectors. Video quality suitable for short sessions. Video quality is necessarily limited by the 1024x768 resolution, but is best described as watchable. The XJ-A147 did well on shadow detail and showed only a hint of posterization on clips that tend to cause the problem. However, colors were a little washed out; skin tones were barely within the realm of acceptable; and in clips with the camera panning across the scene, I saw more obvious judder than with most projectors. Factor in the rainbow artifacts showing often enough to be bothersome for people who see them easily, and it's best to limit video with XJ-A147 to a few minutes at a time.